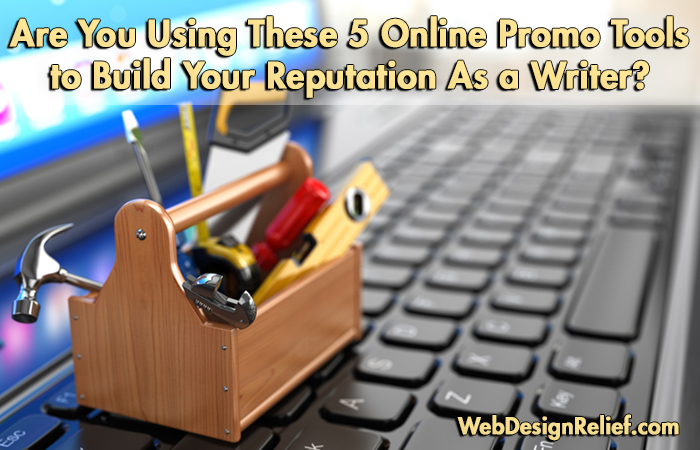 Are You Using These 5 Online Promo Tools To Build Your Reputation As A Writer? As a writer, you probably want to spend most of your time focusing on your writing, and less time posting on Facebook, Twitter, or your author website. But your online platform is essential to launching a successful writing career in today’s publishing industry. These exciting online promotional tools can minimize the time you spend on social media, while simultaneously helping you connect with more fans and build up your author platform! If you have upcoming readings, book signings, or other writing events, an interactive events calendar on your website will help visitors stay up to date with your promotional activities. Calendars with Google integration will give fans an easy way to check the location of your events using Google Maps, or to add a reminder to their own Google Calendars so they don’t miss your next signing or reading. By making it easy for fans to follow your events, you can increase attendance and quickly get the promotional word out about your book. Just be sure to keep your listings relevant and current. Posting across a wide range of social media networks is a great way to maximize your interactions with fans—but keeping a handle on Twitter, Facebook, Google+, and other platforms all at once can become overwhelming! Social media management tools like Hootsuite can help writers post and schedule content across multiple platforms, as well as manage other followed pages and track relevant search terms. With everything displayed in panels on one page, managing social media posts has never been easier—and you’ll have access to a wide range of platforms to effectively promote your work! If you want to contact your fans directly, a mailing list is the way to go! With just a few clicks, you can send direct messages to any subscribers who have provided their emails, ensuring that fans know about upcoming appearances, giveaways, and contests. While it’s important to include big announcements like book launches on your homepage, some fans may not check your website every day. Using a mailing list manager like MailChimp will help ensure your promotional news makes it into your readers’ inboxes. Boosting and promoting your posts on Facebook and Twitter can be a powerful marketing tool—them correctly. Although you do need to pay a fee to boost your posts and tweets, you’ll be able to share your content with a wider audience and get more exposure in the long run. If you have a new book or other project you want to build an audience for, increasing the reach of your posts on Facebook and Twitter might help you get results and build your fan base! Hosting a contest is a smart way to increase traffic to your social media and website and reach potential new fans. But if you’re worried about the many hours you might have to spend planning, organizing, and running a contest, don’t panic—there are apps available to help you run great social media contests. Some, like WooBox, ShortStack, Binkd, and Tradable Bits have free versions you can use to make your contest a success. QUESTION: What promo tools or plug-ins do you use on your author website? In our first article about Inbound Marketing For Authors, we learned how Inbound Marketing can benefit your author brand. 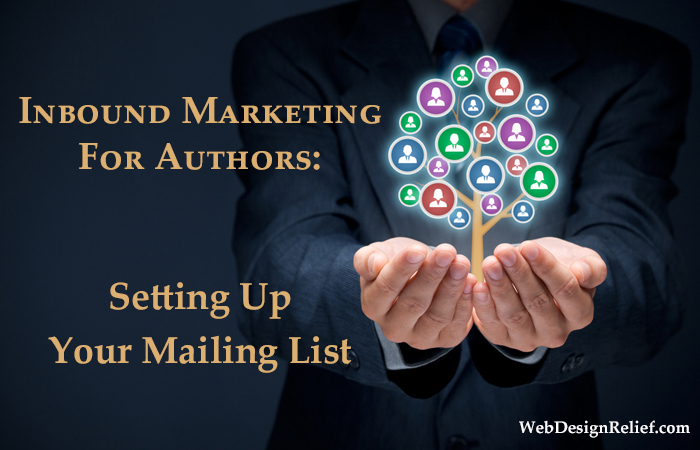 Now we’ll take a look at how to set up a mailing list, integrate it into your author website, and send out your first mailing. Let’s get started! Your mailing list is the most important element of your Inbound Marketing strategy. Having a mailing list gives you immediate access to a built-in audience that’s already invested in your author brand and your writing. To set up your mailing list, you’ll need to choose a mailing list management company that offers the kind of service and support you’re going to need. There are many out there: MailChimp, iContact, and Constant Contact, to name a few. If you’re just starting out and want a user-friendly interface, we recommend MailChimp, because it also offers you the benefit of seamless integration with WordPress (more on that later). Import any email addresses you have from previous lists: If you’ve had a mailing list before or if you have a list of friends or other personal contacts you wish to add, you can do that. NOTE: Make sure you have permission before you add someone’s email address to your list. Failing to do so may constitute spamming. Create a campaign: A campaign is a prepared group of mailings with a defined purpose. Maybe your first goal is simply to share information about yourself. Your campaign would then start with a mailing that introduces your subscribers to your author website’s latest content. Later, you can apprise your followers about your books and appearances, etc. How you integrate your mailing list into your author website may depend on how your site is built. Most email marketing providers give their users bits of code (usually HTML) that they can place on website pages of their choosing. However, there are some companies that allow compatibility with different CMS, such as WordPress. If you’re using WordPress and MailChimp, we recommend this plugin to create a simple yet attractive opt-in form for your author website. Remember to showcase your opt-in form in a prominent place, such as a sidebar or anywhere above the website’s fold. Include a clear call to action so users know how quick and easy it is to sign up for your mailing list. Pro Tip: Offer first-time subscribers a freebie (such as an e-book, excerpt of your novel, etc.) as an incentive to sign up! Check out this example on our subsidiary site Self-Publishing Relief. It’s Time To Send Your First Mailing To Subscribers! Make the call to action clear: Decide what action you want readers to take and gently lead them toward taking it. Don’t clutter your mailing with information subscribers aren’t expecting. Showcase your latest blog posts or news items in a tantalizing way. Remember, it’s important to tempt subscribers with just a taste of what’s new on your author website—don’t hit them with everything and the kitchen sink! You want to encourage your subscribers to click through to your author website to read the full story or blog post to increase traffic. Pro Tip: Make sure you have clearly defined calls to action on any page you send subscribers to in order to keep them engaged and interacting with your content. QUESTION: Have you used a mailing list to increase traffic on your author website or boost sales of your book?